The Gita: Srimadbhagwadgita: श्रीमद्भगवद्गीता : Chapter 1:1..continued | Its all about you! It is very aptly said that if you are able to grasp even one singly teaching from a master that is sufficient to transform your life. Through contemplation which is also referred to as “swaadhyaaya” you allow penetration of these words in your psyche. So you should not only read it but allow its effect to to work upon your being and you will see your thought process has started shifting from mundane to the relevant, from gross to subtle, from material to etheric, from worldly to divine, from darkness to light. The words of your parents, elders teachers and preachers all stay there deep in your mind.. in subconscious and that is why whenever you are surrounded with hardships, with difficult situations and on the verge of critical moments you find some inner voice taking over your mental chatter. At the juncture you are told by that divine voice that come what may.. the victory of truth is evident and that those who act through malice are meted with what they deserve.. that there are universal forces which oversee and governs the universe through different laws. It is in these situations when probably law of karma is rewritten for all those who have been blindly refuting it under the intoxication of power, money and fame. In the first verse of Srimad Bhagwadgita and When Dhritarashtra uses term “dharma-kshetre” it is the same psychological force acting and these words are spoken over riding Dhritarashtra’s mental chatter, confusion and fears. In fact the question Dhritarashtra is posing is worth considering.. he is asking “What did my and Pandu’s son (yuyutsava – desirous of war) did in the Kurukshetra? Don’t you think he would know that his sons are desirous of war and now when they are standing face to face what else they would do? But he asks because he is fearful for he knows that Pandavas are stronger, more skillful and art of battle and he definitely is able to recall many incidents of past where Pandavas had proved their strength and humiliated Duryodhana and his brothers. He also knows that Kurukshetra is the place where sacrifices are offered to the Gods and that his sons are not on the path of righteousness.. and that Dhrama will prevail in this decisive war on this very battle field. Thus frightened he unconsciously utters the word “Dharmakshetre”.. field of righteousness. His question shows that he is expecting some turnaround.. that he is hoping for some miracle. He is internally hoping this war wouldn’t happen.. but this has never happened. The forces of darkness and forces of light will definitely confront at some point or the other and if at all you see any delay in this not happening it is only that both of these are acquiring a minimum critical mass in the process of waiting. The same happens here.. it took years of avoidance but ultimately threshold crosses and war becomes inevitable. In this world, your day to day activities are happening in “Dharmakshetra” and each day, every moment you are fighting a battle. Your action or karma is your way of fighting this battle. Kuru is a sanskrit word originating from kri – dhatu which means ‘to do’. Your Karamas happen in this Field of action “Kurukshetra”. Keep a close watch whether your actions are leading to light or darkness.. will it be just or unjust, whether you are on the side of truth or not. The fearfulness can hold you from responding to a war situation, an unjust action but that cannot be avoided beyond a point. You may choose not to retaliate to the unlawful, unjust things under any pseudo emotion.. as mercy, forgiveness or compassion but the root cause is fear. Gita teaches you to be fearless and respond to the situations true to your emotions. It teaches not to be diplomatic but be ready to hold the bull by horn if that be need of hour..
A Dhritarashtra can be fearful but you will not be if you have kept your actions rooted in the truth. How? Only if you would listen to the divine voice of conscience, your Guru while dealing with everyday life you will be rooted in truth and then you find universal principles of justice working through you. And such a person is always victorious. Master AD, as Acharya Agyaatdarshan Anand Nath is lovingly called by his disciples, friends is a true Tantra Master. You can either love him or hate him but for sure you can NOT ignore him. He and his beloved consort Ma Shakti Devpriya Anand Nath are engaged in spreading scientific spirituality in masses through their Tattva Shakti Vigyaan initiation camps. 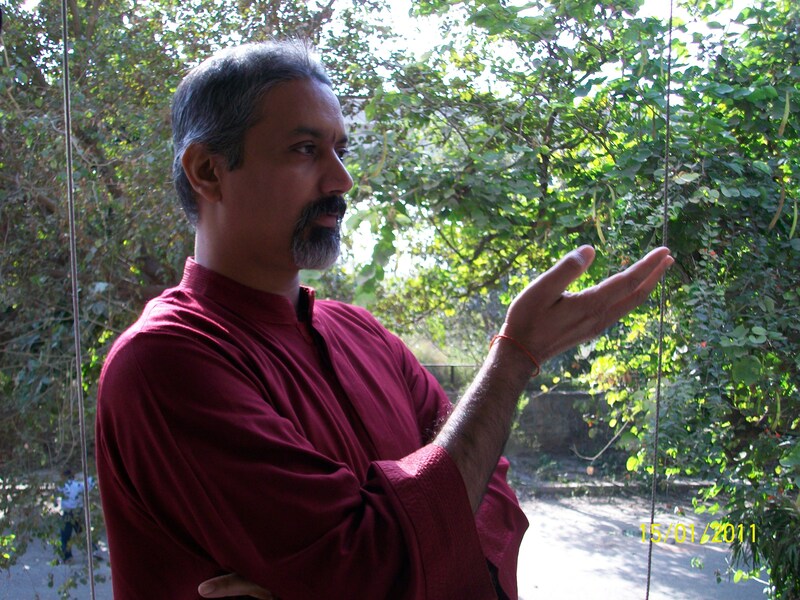 Master AD, a poornabhishikta in Srividya (Krama System) has equal command on Yoga, Pranamaya, Tantra and Kriya Yoga techniques and guides seekers worldwide through 'The Shakti Multiversity' platform. This entry was posted in Master's Silence and tagged Aatmik anubhav, Ach. AD, Ach. Agyaatdarshan, arjun vishaad yoga, Babuji, bhakti, dharma, Dhritarashtra, enlightenment, gita, God, Guru, indian religious books, krishna, mahabharata, Meditation, need of etiquette training, Pandit Murli Dhar Mishr ji, religion, sanjaya, Self-realization, Shree Krishna, srimad bhagwadgita, Yoga. Bookmark the permalink. Negative effects of Sudarshan Kriya!